Now is the time to enjoy local strawberries from your farmers market. These freshly picked beauties are smaller than conventional strawberries and a deep red hue indicating they’re sweet and juicy. These strawberries are perfectly delicious as is but they are even been when roasted! They become soft, jammy, and even sweeter. 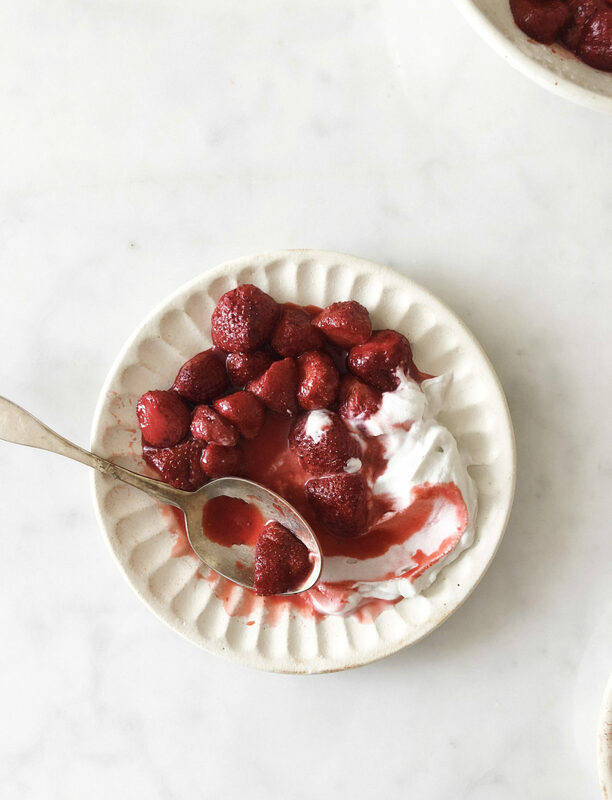 Roasted strawberries can be made in advance and enjoyed countless ways, such as a topping for your oatmeal, yogurt, ice cream, or slathered on toast. I personally think they’re best enjoyed warm from the oven with a heaping spoonful of coconut whipped cream. Friends who rarely step into the kitchen have told me countless times that my recipes look delicious but they require too many ingredients. This recipe is my answer for those with an insufficient pantry. Strawberries, coconut cream, honey, vanilla extract, and almond extract. Okay, almond extract might be pushing it for the non-cook but it can be omitted or replaced with vanilla extract. This easy recipe won’t disappoint and makes the perfect after dinner treat for yourself and friends. If you desire chocolate (which we all do right?) chop up some dark chocolate and sprinkle it on top. This recipe also goes perfectly with my Almond Flour Fudge Brownies. Just layer the brownies with the roasted strawberries and whip! Preheat the oven to 350°. Line a baking tray with parchment paper. In a large bowl combine all of the roasted strawberry ingredients. Scatter into a single layer on baking tray and bake for 25 minutes. 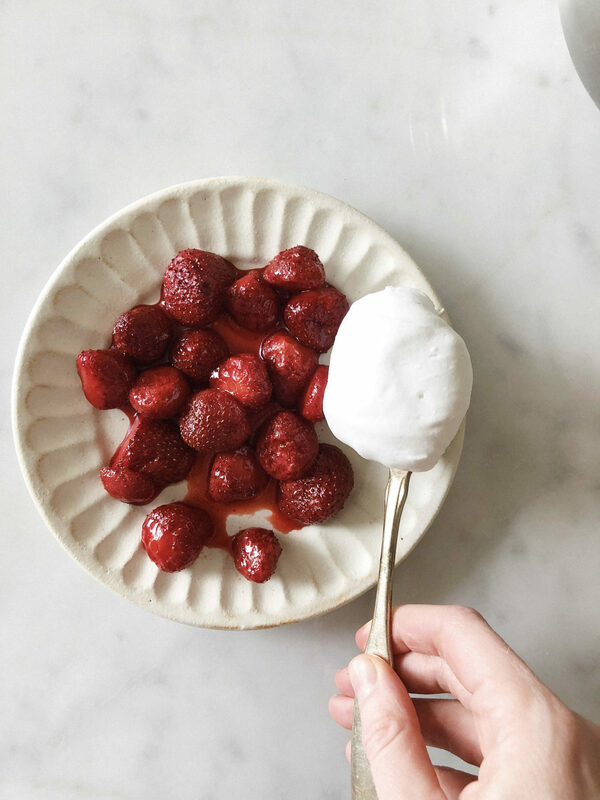 Remove strawberries from the oven and serve hot, warm, or cold with the almond coconut whip. Place a mixing bowl in the fridge for 10 minutes. In cold mixing bowl, using an electric mixer, whisk together the coconut cream, honey, and almond extract. Whisk until fluffy. *If you can't find coconut cream purchase full fat coconut milk. Flip it upside down so the coconut cream is on the bottom and place it in fridge overnight. Remove lid and pour and discard out the coconut water. This entry was posted in Dessert and tagged beegan, coconut, coconut cream, farmers market, honey, local strawberries, organic, plant-based, spring, summer, Vegan. Bookmark the permalink.